Ilan Tochner is the Co-Founder and CEO of Kitely. The website Hypergrid Business is now holding its ninth annual OpenSim grid survey, and we need your help to be able to attract additional people to our growing community. If you’re willing to spend a few minutes to help spread the word about Kitely then please answer this short multiple choice survey. Last year many of you participated in the survey and your endorsement helped convince more content creators to list their items in Kitely Market and more people to join our community. Your continued support this year is crucial for our continued growth. 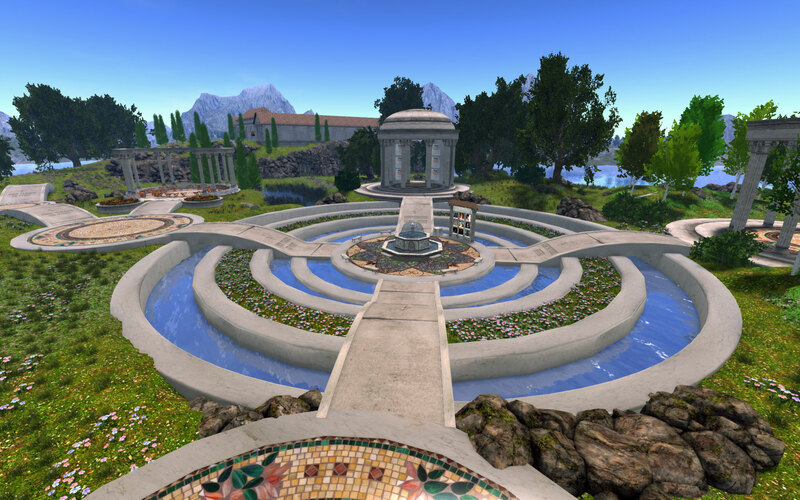 InWorldz, one of the oldest and largest OpenSim grids, has recently shut down. 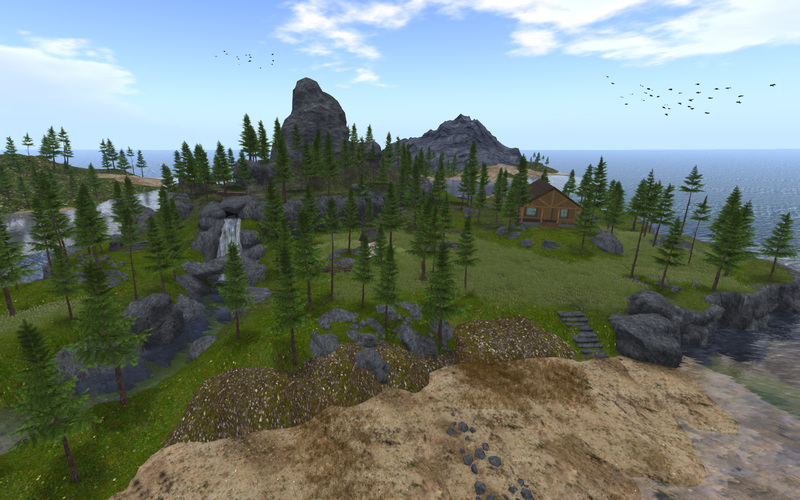 Since then, many InWorldz residents have moved to other grids in search of a new home. Thanks to Kitely Market, we now have some hard data that shows the scope of this exodus, as well as which grids were the preferred destinations for InWorldz residents. We have seen a remarkable 300% spike in Kitely Market sales since InWorldz has shut down, as users that moved to new grids began restocking their avatar inventories. InWorldz didn’t allow its residents to use Kitely Market, so for many of these users this is the first time that they’ve been able to buy from our marketplace. We saw Kitely Market sales begin to rise on July 26, a day before InWorldz shut down. The graph below compares sales from the week since InWorldz shut down, to the average weekly sales in the three weeks before that. 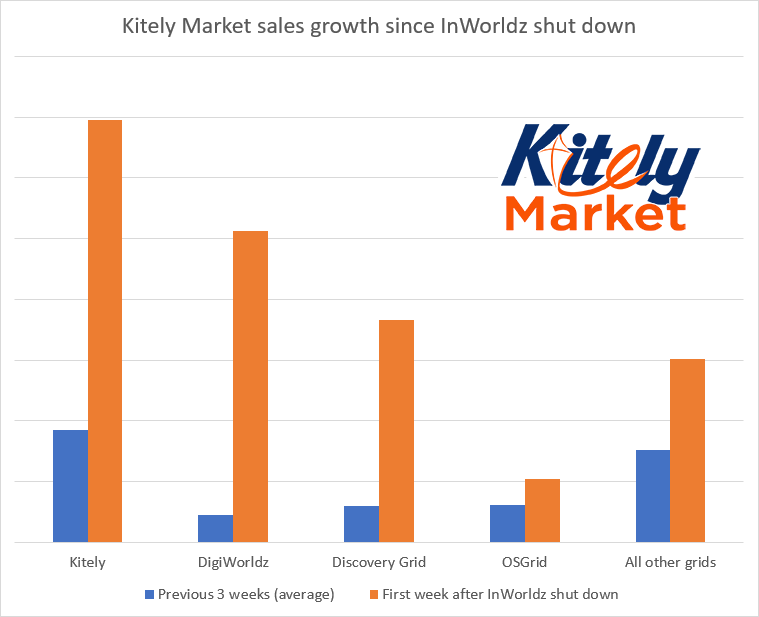 Kitely’s own grid experienced the biggest growth in absolute numbers, but DigiWorldz and Discovery Grid experienced the most growth relative to their previous sales levels. Kitely Market delivers to all Hypergrid-enabled OpenSim grids. This page explains how to buy items from Kitely Market and have them delivered to your avatar on another grid. If you are the owner of a closed grid and you want to allow your users to buy from Kitely Market then follow these directions. The website Hypergrid Business is now holding its eighth annual OpenSim grid survey, and we need your help to be able to attract additional people to our growing community. If you’re willing to spend a few minutes to help spread the word about Kitely then please answer this short multiple choice survey. We are proud to announce that we’ve passed a new milestone: with significant growth over the past year, Kitely Market has sold over $100,000 worth of virtual goods to date. Kitely Market first opened to the public on August 2013. Over the past few years, Kitely Market has become the main marketplace serving the OpenSim metaverse (the Hypergrid). When Kitely Market first opened it had under 1,000 product variations listed. It now offers more than 17,000 product variations. Kitely Market’s sales revenue last month was over 16 times higher than its sales revenue on its first month in business. When Kitely Market opened, Kitely was still a closed grid and only Kitely users could buy from it. In March 2014 Kitely Market started delivering to the Hypergrid, and has since delivered to avatars on more than 170 different OpenSim grids. Our top merchant has sold more than $10,000 worth of virtual goods. Our top 10 merchants have each sold at least $1,300 worth of virtual goods. More than 100 Kitely Market merchants have each sold at least $100 worth of virtual goods. One of our main goals for Kitely Market was to enable content creators to easily make money selling their creations to users from multiple OpenSim grids, without having to manually deliver their goods to all of those grids. Kitely Market’s growth over the past few years demonstrates that talented content creators can see a nice return from selling to an open metaverse, even when it still includes only a few tens of thousands of active users, which are spread between hundreds of different grids. Thank you for using Kitely Market! Your help in spreading the word about our marketplace is what enabled it to grow and provide you with more content buying options. With your continued support, we believe that this year we’ll be able to serve even more buyers and content creators. The website Hypergrid Business is now holding its seventh annual OpenSim grid survey, and we need your help to be able to attract additional people to our growing community. If you’re willing to spend a few minutes to help spread the word about Kitely then please answer this short multiple choice survey. An important part of the Kitely experience is the Kitely Welcome Center. This world is the main entry point to our grid, and it serves to introduce new users to the wide range of services and destinations available in Kitely. We are happy to announce that today we rolled out a new and improved version of the Kitely Welcome Center. This updated version was created from scratch, with the goal of retaining the spirit of the previous welcome center while improving its usability and performance. Ozwell Wayfarer: designed and built the new Kitely Welcome Center, using as inspiration the design that Paislee Myrtle created for the original welcome center. Most of the items in the new welcome center were contributed by Ozwell from his Kitely Market store, Worlds End Landscaping & Roleplay. Dot Matrix: was the project coordinator and created the information signs. Serene Jewell: provided usability feedback early on, and was later joined by more than a dozen other Kitely community members in testing the new world. Tocy Sweet: was not directly involved with this project, but she deserves credit for the graphical design of the signs in this world (which were created by Dot), since they’re based on her design for the Kitely Market advertising campaign. Tocy’s Kitely Market store is Sweet Distractions. Dundridge Dreadlow: was not directly involved with this project, but he deserves credit for creating some of the scripts that were taken from previous versions of the Kitely Welcome Center. Dundridge’s Kitely Market store is Dundridge Dreadlow Developments. If you have any existing landmarks for Kitely Welcome Center then they will no longer work, because this new world replaced the previous one. Please visit the new Kitely Welcome Center by using its world page or its Hypergrid address (grid.kitely.com:8002:Kitely Welcome Center), and create new landmarks to replace your outdated ones. Likewise, if you’ve previously set the Kitely Welcome Center as your Home in the viewer, then enter the new Kitely Welcome Center and reset your Home to the new world. We want to give special thanks, yet again, to Ozwell Wayfarer who spent hundreds of hours creating this new world. While many other people played a part in creating the new welcome center and the ones that preceded it, Ozwell did the lion’s share of the work in making this new iteration possible. Thank you to all past and current contributors who’ve helped build this wonderful virtual world. We welcome everyone to come and visit! Whenever you create a new Kitely world, you select a template that determines the initial contents of the world. Two of these options are to start off with just some empty land, or to upload your own OAR (OpenSim Archive) file. In addition, we provide a couple of options for fully-functional worlds. Before today’s update, these world templates were Universal Campus and OpenVCE. These templates are based on freebie content that is quite dated, and also widely available in many other OpenSim grids. We felt that you deserve more. We wanted to be able to offer you a pre-configured world full of high quality mesh content that is professionally laid out and optimized. We wanted it to be comfortable enough for you to feel at home immediately, but with enough possibilities that you could tweak it and make it your own. We wanted you to be able to change everything in that world and reuse it in other Kitely worlds. And we wanted to be able to offer you all of that content for free. Several Kitely community members have stepped up and created Kitely Evergreen Island to address these needs (see the next section for acknowledgments). The result is a world that contains premium content from some of Kitley Market’s top selling merchants, which you can reuse in all of your Kitely worlds. All of this professional content is licensed for use for free anywhere in Kitely. It has Copy/Modify permissions, so you can simply pick up pieces in your copy of this world and use them in other Kitely worlds. However, this content can’t be exported to other grids, using either the Hypergrid or the Export World option (which creates OAR files). You can get exportable versions of these items by buying them in Kitely Market from their creators (see the list of stores below). Kitely Evergreen Island is an example of how a great looking world can also be highly optimized. This world starts up in seconds, and requires very little CPU resources to run. This new world template replaces the OpenVCE template, which we are no longer offering. We still offer the Universal Campus template, however, as it’s still the best starter option for a large world that can host many people. Ozwell Wayfarer: designed and built Kitely Evergreen Island. Almost everything included in this world is a contribution from his Kitely Market store Worlds End Landscaping & Roleplay. Zuza Ritt: contributed a cabin from her Kitely Market store 21strom. Dot Matrix: was the project coordinator and created the information signs in the cabin and the landing point. The New World dialog now shows a screenshot of each world template option. This makes it easier to understand what you’ll get with each option, especially for new users. We want to reiterate our gratitude to Ozwell, Zuza, Dot and Tocy. Their generous contributions of time, skill, and content made it possible for Kitely to offer you this great new world template free of charge. To get your own Kitely-hosted copy of Kitely Evergreen Island, with Copy/Modify permissions for everything in that world, go to your My Worlds page and create a new world using the Kitely Evergreen Island template. Kitely supports worlds that have more than one region. Currently, such worlds can be run in one of two modes (selected by the world manager): Multi-region, or Advanced Megaregion. This will change on December 9, 2015: these worlds will be converted to VarRegions, and the option to run worlds in Multi-region or Advanced Megaregion mode will be removed. This post explains why we’re making this change, and how it will affect you. Three years ago OpenSim supported two ways to create big worlds: 1) By placing multiple separate regions next to each other: this is called “Multi-region mode”. 2) By combining multiple small regions into a single big region, called a “Megaregion“. Multi-region mode suffered from many problems. First, there were slowdowns and errors when avatars and objects (including vehicles) crossed region borders. Second, it was wasteful in server resources, making worlds operate slowly. Megaregion mode was more efficient in using server resources, although still not great. It didn’t suffer from region crossing problems, but it did have other limitations that prevented it from being a good alternative to multi-region mode. Kitely’s solution was to develop Advanced Megaregions, which were both more efficient than regular megaregions, as well as solving many of their limitations. Two years later, at the end of 2014, OpenSim 0.8 introduced a third option for creating big worlds: VarRegions. VarRegions behaved similarly to Kitely’s proprietary Advanced Megaregions, but they had some important limitations. First, they didn’t support the ODE physics engine, which Advanced Megaregions did support, and that was then (and still is) the most dependable OpenSim physics engine. Second, they required all users to upgrade their viewers, since older viewers didn’t support VarRegions. Third, they were less flexible than megaregions in selecting region settings for big worlds. We therefore decided that it was premature to switch Kitely from using Advanced Megaregions to using VarRegions. Recently, however, OpenSim 0.8.2 was released, and it has fixed the biggest problem with VarRegions, by allowing them to use ODE. In addition, OpenSim 0.8.2 has deprecated support for megaregions. Since Kitely’s Advanced Megaregions depend on a part of OpenSim that is no longer maintained, we were left with two options: either we keep the old code, thus making it hard for us to remain compatible with future OpenSim releases; or we migrate all Kitely Advanced Megaregions to use VarRegions, and thus maintain our ability to remain compatible with the standard OpenSim branch. We chose the second option. All big Multi-region and Advanced Megaregion worlds will be converted to VarRegions. The option to switch between Multi-region and Advanced Megaregion mode will be removed. This means that even if you didn’t use Advanced Megaregion mode before the upcoming change, your big worlds will still be converted to VarRegions. Importing an OAR file that contains multiple regions saved in Multi-region or Megaregion mode will result in the contents of the OAR file being automatically converted to use VarRegion mode. Exporting big Kitely worlds will always create a VarRegion OAR file. The region settings of the root region will now be used in the entire big world. This will happen regardless of whether that big world had used Multi-region mode or Advanced Megaregion mode. These settings include terrain textures, water height, etc. This means that if you had set different region settings for different parts of your big world, then the settings for all of the regions except for the root region will be lost. The settings in the root region will be used throughout your world. Some landmarks might stop working, although this should be rare. Landmarks that were created in a non-root region of a Multi-region world will stop working, because those regions won’t exist anymore. Landmarks for the root region, as well as any landmarks that were created in an Advanced Megaregion world, will continue to work. Since most big Kitely worlds are using Advanced Megaregion mode, this change should have very little effect on most of the landmarks that people have created in Kitely. All other world management features provided in your Kitely account control panel will remain. This includes the ability to change world sizes, change the physics engine, etc. Most people don’t need to do anything. If you want to have a backup of your world in Multi-region or Megaregion mode then you need to Export your world before the upcoming change. This will create a Multi-region or Megaregion OAR file. You’ll still be able to export your world after the change, of course, but at that point the OAR file will use VarRegion mode. Starting on June 1, 2015, we will no longer be offering Premium Accounts. Users who already have a Premium Account on that date will be able to keep it, but new users will no longer be offered this option: they will only be able to choose one of our Fixed-Price Worlds. The reason we’re making this change is to simplify our offering. Currently we offer two very different ways to get land: Premium Accounts and Fixed-Price Worlds. However, we’ve found that having two different pricing models is often confusing to potential customers. Once we explain the benefits of Premium Accounts people understand them and often choose to get them. But this requires a significant sales effort, and we don’t always get the chance to do that: our analytics, and the customer feedback we’ve received, show that often people become intimidated by the wealth of options that we currently provide and decide to just go elsewhere. Kitely currently offers two main types of worlds: Fixed-Price Worlds and Premium Worlds. Fixed-Price Worlds – the world manager pays a fixed price per month, and then never has to pay anything more to use the world. In particular, the world manager doesn’t need to pay when users visit the world. Fixed-Price Worlds have varying prices (starting at $14.95): the more expensive worlds support more regions, more prims and more avatars. Premium Worlds – the world manager doesn’t pay a fixed price per month to use these worlds, but does pay a small fee for various actions performed on the world. In particular, when users who don’t have a Premium Account visit the world, the world manager pays 1 KC / minute for each such user. (Premium Account users can visit Premium Worlds without costing the world manager anything.) In addition to being very cheap, Premium Worlds have another advantage over Fixed-Price Worlds: all Premium Worlds have performance that is equivalent to the most expensive Fixed-Price World (the Advanced World, which costs $99.95/month): they all support up to 16 regions, 100,000 prims and 100 concurrent avatars. Only users that have a Premium Account can create Premium Worlds. This allows them to have a lot of land very cheaply: a Premium Account includes 10 free regions (upgraded today; previously it was 5 regions), and additional regions cost only 300 KC per month. Hundreds of Kitely users currently have a Premium Account. You can join them by getting a Premium Account before June 1. Anyone who gets a Premium Account before June 1 will be able to keep it for as long as they continue to pay for it. First, we’re bringing back one of our most popular options from the past: the Gold Plan. The Gold Plan is a type of Premium Account, but it includes 30 free regions, and costs just $34.95/month. This is the absolute best way to get a lot of cheap land anywhere! This offer, too, will expire on June 1. Second, we upgraded all Premium Accounts to get ten free regions (instead of five previously). This change is effective immediately, for both current customers and anyone who gets a new Premium Account before the cutoff date of June 1. Q: Why is Kitely making this change? A: Premium Accounts and Premium Worlds offer people great benefits, but their existence makes our offering hard for people to understand and explain to others. This means that we’re losing sales because of our flexibility. By offering fewer options we’ll help people understand the value of our service better, which will help increase our sales. A: If you only visit other people’s worlds, but don’t own your own worlds, then this change doesn’t affect you at all. If you do own your own worlds, and you have a Regular Account, then the only change you’ll feel is if you Copy one of your worlds, because the new copy will now be a Stored World (which no one will be able to enter) instead of a Premium World (which Premium Account holders can enter). But the copied world will still contain a snapshot of the state of your world, and you’ll be able to Export it, or upgrade it to a Fixed-Price World. If you have a Premium Account (or one of its variations) then this change doesn’t affect you as long as you retain your account status. However, If you ever cancel your Premium Account after June 1 then you won’t be able to upgrade back to a Premium Account, and all of your Premium Worlds will be converted to Stored Worlds. Q: Will Kitely still provide a free trial period to new users who want to create a world? A: The Gold Plan is available right now. You can upgrade to it (or to a Premium Account) by clicking on the “Change plan” link in your Kitely Account Settings page. (You might need to refresh the browser in order to see the new plan.) The increase of Premium Accounts from 5 free regions to 10 free regions is also already in effect. Q: If I have a Premium Account, can I still get Fixed-Price Worlds? A: Yes. You can have both Premium Worlds and Fixed-Price Worlds in your account, and you can switch individual worlds between these two types. Of course, you must get a Premium Account or a Gold Plan before June 1 in order to have this flexibility. We encourage you to take advantage of our limited-time offer to upgrade to a Premium Account or Gold Plan before the end of the month, and get the long-term benefits that will be provided exclusively to those plan holders. This offer will not be available after May 31, so if you want these benefits you should order now. We believe that Premium Accounts offer by far the best price-performance anywhere in the OpenSim metaverse, and Kitely is the only company capable of offering them because we’re the only ones who use on-demand cloud-based simulators. The only reason we’re discontinuing Premium Accounts is due to their complexity. But for people who understand their benefits and want to take advantage of them, there is no better choice.